As part of the interdisciplinary units, teachers use the language and concepts of their disciplines to teach the unit, thereby, also teaching the connections between and among disciplines that often are missed in traditional high school classes. During the pottery unit, for example, teachers investigated pottery from many different perspectives — historic, economic, chemical, geological, mathematical, geometric, symbolic. The students discovered concepts and thinking beyond the textbook basics. Science teacher Dr. Norma Johnson (retired 2014) discussed the science of pottery: chemistry of glazes, chemistry and geology of soil, and soil science with a focus on clay. Her classes also grew plants used for natural dyes in the school’s garden, with the help of a local organic farmer. Mathematics and physics teachers introduced the physics of the wheel, the physics of the kiln, the properties of translucence, heating and melting points, and the stresses on the pots as they are being thrown and baked. Geometry students examined the mathematical concepts related to pottery pieces, including size and proportion, ratios and symmetry. U.S. History students looked at the development of pottery as an industry, and the development of a variety of ideas that connect communities, including the “Ugly Jug.” Under the direction of the art teacher, students learned color theory, design, and production, and created tiles and decorative pots. Spanish classes focused on vocabulary related to pottery and also introduced students to comparative cultures by analyzing the differences between clay works from the United States and clay works in Spanish speaking countries. As a culminating activity, each Hawbridge student produced a relevant product designed to reveal his or her understanding of the connections across content areas, as well as what had been learned about pottery. Among those were exhibitions of tiles and pots the students made; PowerPoint presentations on the history of pottery; drawings and paintings of decorative earthenware; mathematical drawings showing scale, dimension, and proportion; and clay that had been dug on the Hawbridge campus and converted to usable clay for pots. Each of interdisciplinary units includes visits by guest speakers who address the entire student body and field trips away from Hawbridge. 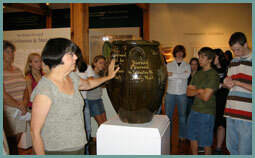 One of the field trips for the pottery unit was to the Ackland Art Museum at UNC Chapel Hill, where students participated in a gallery activity entitled “Close Clay Vessel Viewing” in which they practiced attending to a work of art in different ways (verbal description, written description, drawing). The content for this activity was the museum’s Asian, North Carolina, and ancient Greek ceramics collection. While at the museum students noticed an ancient Asian pot much like the one in the novel, A Single Shard by Linda Sue Park, which freshman English students read. The beautifully illustrated prose-poem When Clay Sings, by Byrd Baylor, also was included in the English pottery curriculum. Thus, students not only critically read stories, they learned the story of pottery and art. They also began developing research skills and learning the power of symbols. The second field trip was to Seagrove, NC. There, students were involved in hands-on learning experiences at the various potters’ studios, and the group visited the North Carolina Pottery Center. 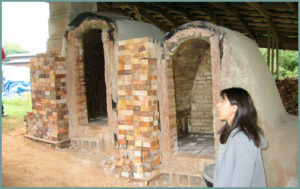 Center Executive Director Denny Mecham and Artist-in-Residence Hitomi Shibata conducted tours of the center and the kiln area behind it. Ms. Mecham’s lectures were science-oriented, continuing the school’s interdisciplinary theme. Bonnie Burns of the Great White Oak Gallery demonstrated throwing techniques and conversed with students, faculty and parents in the Marion Stedman Covington Education Building. Several potters from the Saxapahaw area, including one who uses a traditional wood-burning kiln, were on the Hawbridge campus to share their knowledge with students and assist in art classes. At least two outside experts address the student body during each unit. Pottery expert Dr. Terry Zug, former chair of Southern Folklore at UNC Chapel Hill and author of Turners and Burners: The Folk Potters of North Carolina, and Dr. Steve Davis, UNC Chapel Hill Research Archaeologist and author of Excavating Occaneechi Town: Archaeology of an Eighteenth Century Indian Village in North Carolina spoke at the school during the Pottery Unit. Dr. Davis’ talk prepared students to participate in an on-site archaeological investigation of the remains of an early 19th century house. Dr. Zug displayed and discussed pots from his private collection and prepared students for the visit to Seagrove. Both professors were invited through Carolina Speakers and were warmly received by the Hawbridge community.